If I can deliver you Scotch Eggs but with a soft-boiled center are you in? Hell, yes!! was the response. So I got up early that day, did suitable research and enthusiastically jumped into this recipe. Naughty ingredients, deep fried, served pub food style. While Scotch Eggs are fantastic served warm with a drizzle of Sriracha Mayo, they also become a great next day grab-and-go picnic food. I chose a pound of hot breakfast sausage to encase our lightly floured soft-boiled eggs (3-4 minute boil, carefully peeled). Then into a classic 3-part breading; flour, egg, seasoned crumbs before a plunge in the fryer. I’ll be the first to admit, I don’t have a lot of deep fryer experience. I understand bringing the oil to the right temp, not over crowding the pot, and adjusting cooking times accordingly. But somehow, fragile soft-boiled eggs, wrapped in pork sausage, then breaded….threw me for a bit of a loop. Once out of the pool, they looked sun-kissed and gorgeous. Yet, an instant read thermometer indicated they weren’t quite presentation ready. We finished our Scotch Eggs in a 350 degree oven for about 10 minutes before serving. While I lost the ‘soft’ center eggs I was hoping for, we sliced into amazing. What a treat. Clearly not a recipe we’ll create weekly, but a fantastic splurge kind of dish. Who am I kidding? 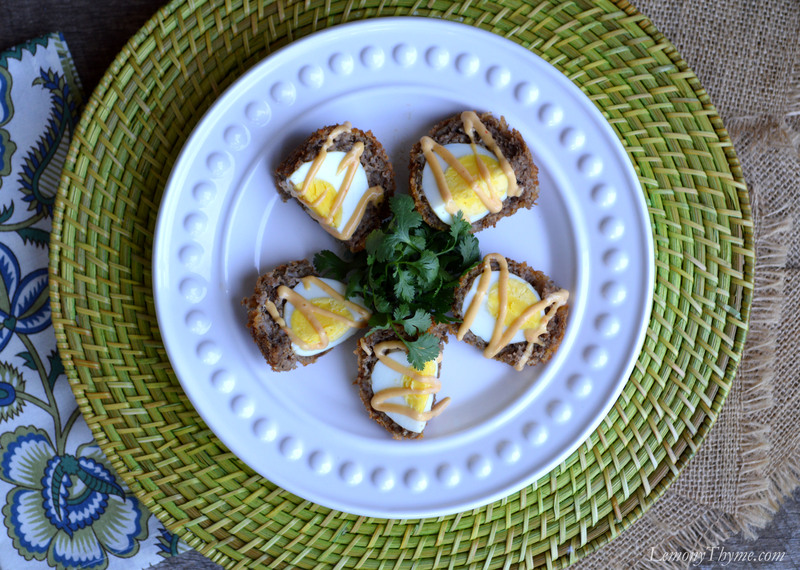 This Scotch Eggs with Sriracha Mayo recipe is pure indulgence and worth every last calorie. Go ahead make their day. While Scotch Eggs are fantastic served warm with a drizzle of Sriracha Mayo, they also become a great next day grab-and-go picnic food. In a medium saucepan, cover 5 eggs with 1-inch cold water. Bring to a boil and continue cooking for 3 minutes. Meanwhile prepare an ice bath. After 3 minutes of boil, remove eggs with a slotted spoon and place in ice bath until cooled. Carefully peel. Form sausage into 5 oval shaped patties, about twice the size of an egg. Set up a breading station with three bowls. Put flour in one. Beat two remaining eggs in another. Add panko and seasoning to a third bowl. Dry peeled eggs, roll them in flour, then place onto sausage patties. Using wet hands (or disposable gloves), shape sausage around egg, being sure egg is completely encased. Then dip into flour, then egg, then panko being sure sausage is completely coated in crumbs. Refrigerate coated eggs while oil comes up to temp. In a heavy pot, heat about 2-inches of canola oil to 375 degrees. Working in batches, fry eggs until nicely browned on all sides, about 6-8 minutes. Transfer to a baking dish and bake at 350 for about 10 minutes or until instant read thermometer inserted into sausage reads 165 degrees. To serve, slice eggs into quarters, then drizzle with Sriracha Mayo. Combine ingredients in a small bowl, then transfer to a squeeze bottle or plastic bag. Drizzle over Scotch Eggs.